Ben Gurion University of the Negev researchers have developed two reversible panes that will save energy all year round. The new all seasons windows reduce energy costs and fuel consumption. Ben-Gurion University of the Negev (BGU) researchers have developed a new, highly energy-efficient window technology, featuring two reversible panes that will save energy all year round in homes and office buildings. “The ‘Seasons Window’ features the only glazing system that permits effective passive heating in winter without glare or high radiant temperature near a window and reduces unwanted solar gains in summer without obstructing the view outdoors,” explains Prof. Evyatar Erell, a researcher at BGU's Jacob Blaustein Institutes for Desert Research. In summer, the glass panes are easily rotated so the tinted glass faces outward and absorbs the warm solar rays. This pane is then cooled by the outside air circulating between the two panes. 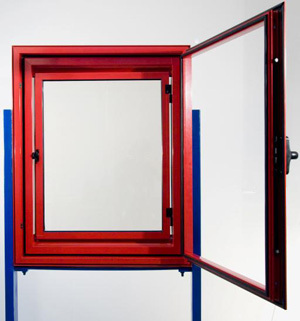 The clear glass pane, which is on the interior, absorbs unwanted infrared radiation from the warmer exterior pane and helps to reduce a building’s cooling loads. About Ben-Gurion University of the Negev and American Associates Ben-Gurion University of the Negev is a world-renowned institute of research and higher learning with 18,000 students on its campuses in Beer-Sheva, Sede Boqer and Eilat in Israel’s southern desert. It is a university with a conscience, where the highest academic standards are integrated with community involvement, committed to sustainable development of the Negev. Founded in 1972, American Associates, Ben-Gurion University of the Negev plays a vital role in helping the University fulfill its unique responsibility to develop the Negev, reach out to its local community and its Arab neighbors, and share its expertise with the world. For more information, please visit www.aabgu.org.